This Spring term, Lancashire Music Hub is running two courses specifically aimed at encouraging and supporting girls and young women to improvise, arrange, compose and produce music. Jazz Camp for Girls, run in partnership with Jazz North, is designed to give girls aged between 9 and 15 the opportunity to develop musical curiosity and confidence through jazz and improvisation, and, for older students, the “Girls Can” project will give emerging female musicians, producers and technicians the chance to compose and produce a piece of original music under the mentorship of industry professionals. While women are not underrepresented in many areas of music, when it comes to composing, producing and jazz and improvised music there is still some way to go. A survey based on works submitted to the 2015 British Composer Awards shows that just 21% of commissioned composers were female, of the PRS for Music’s membership of over 95,000 songwriters, composers and music publishers only 13% are women, and according to the Music Producer’s Guild, only 6% of its members are female. So why are these areas so male dominated? What factors in education or wider society mean that girls often don’t have the opportunity, confidence or aspiration to improvise, create and compose music? As a young musician growing up in the late 1990s, I was always more interested in making up my own music than playing the “dots” and I found, through jazz, the perfect combination of structure and freedom. My story certainly isn’t one of overcoming adversity – I was lucky to have so many things which encouraged and sustained my interest in improvisation and composition. I had a supportive musical family, access to music technology, a secondary school which promoted and celebrated the arts, and a wide range of musical experiences and opportunities with teachers and mentors (incidentally all male) who encouraged and supported my interests and ambition. But as I got older, I noticed that I was often the odd one out. Jazz appeared to be a bit of a boys club and being the “only girl in the band” was the norm. Many times I turned up to gig to be asked if I was the singer as that was what fitted with the stereotype. Studying jazz at Leeds College of Music, I was one of only a handful of female instrumentalists on my course and, while there were certainly some inspirational role models and progressive thinkers, there were undeniably stereotypes and assumptions which shaped my experience and aspirations. Looking back, the main question I ask is where were my female role models? I did find some but had to look extremely hard! (I eventually came across pianist Nikki Iles and composer and bandleader Maria Schneider). There were many musicians I took inspiration from, but there is something important in looking up to a role model in whom you can see your future self – you relate to them in a different way when, as a young woman, you see a female jazz musician or composer working hard, being taken seriously and achieving great things. I am delighted to see how much this has changed over the last 20 years. 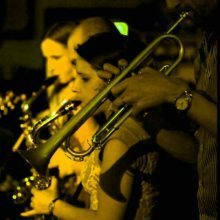 The visibility of women as jazz musicians, composers and producers has increased greatly and there is now a real effort by organisations such as PRS for Music, the BBC, Trinity Laban, the National Youth Jazz Collective, National Youth Jazz Orchestra, GCSE and A-level Examination Boards, to name just a few, to address the underrepresentation of women. Although there is still some way to go, I believe we are moving towards a more level playing field and we can all do our bit as parents and carers, musicians, teachers and leaders to encourage and support girls as improvisers, composers and creative musicians.